Today marks the beginning of week #5 in the giveaway to celebrate the launch of my new book, Nourished; A Cookbook for Health, Weight Loss, and Metabolic Balance. THERE WILL AGAIN BE TWO LUCKY WINNERS! HOMESTYLE BEEF AND BEAN or CHICKEN AND BEAN CHILI, with a retail value of $32.28. with a retail value of $62.99. The total value of each of the two prize packages is $95.27! I’m sure I cook more than the average person, but sometimes I still long for the days when lunch was as simple as “open–heat–eat.” Homestyle Chili is a delicious option for those days when you want something good and hearty but don’t have the time or energy to make it from scratch. You won’t be tempted to fall off the low-carb wagon and order a pizza or grab a sandwich if you have a few packages of this chili in your pantry. Homestyle Portable Portions Beef or Chicken Chili with Beans also makes a great portable lunch or snack to take to the office or anywhere with access to a microwave oven (or a pan and stove top). Many schools now provide microwaves for students who bring bag lunches so they can prepare their own hot lunch. Each serving contains 26 grams of protein and less than 5 net grams of carbohydrate. The packages require no refrigeration and the handy, microwavable, single serving plastic cups are BPA free, also an important consideration. My favorite accompaniment for chili is a handful of the Almond Parmesan Crisps from Nourished, made of almond flour and Parmesan cheese. They have a net carb count of 0.2 grams each. If you make them very thin and bake them until they are golden brown, they taste a lot like Pringles, but 5 Crisps have only 1 net carb, the amount in one potato chip! Make them ahead and and keep them handy to pair with your Homestyle Chili whenever you need an easy, tasty meal at home or on the go. For more information, customer reviews, and where to purchase Homestyle Chili, go to: http://www.homestylefresh.com/main.htm. The EZ-Sweetz company has generously provided two more 6-packs of their large bottles of liquid sucralose for my readers. The picture above shows only one bottle, but each of the winners will get six! Each 6-pack contains a total of 1,800 servings of sugar-free, calorie-free, zero carb, sweetener. One drop of EZ-Sweetz equals 1 teaspoon of sugar. It is heat stable and can be used in recipes that will be cooked. Unlike some sweeteners, sucralose does not alter the effect of medications or affect blood glucose levels and it has been approved for use by children and pregnant or nursing mothers. 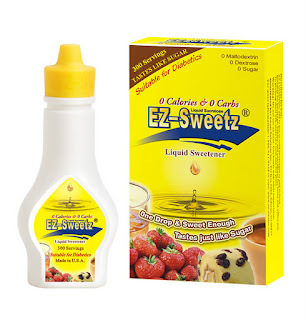 EZ-Sweetz will be featuring special introductory offers and coupons on their website at http://www.ezsweetz.com/ and on their Facebook page at http://www.facebook.com/ezsweetz?sk=app_108742052506030 in the next few weeks to mark the introduction of EZ-Sweetz in retail stores across the country. I would be a happy winner here! Please enter me in this giveaway. This is fun! Would love to win one of these packages. Yeah! What a nice giveaway for low carbers. You are the best! I'd like to enter this giveaway sweepstakes, please. Thanks. I would love to win! MelStrm12@yahoo.com. Yay low-carbs! I would be thrilled to win this package! Please enter me! What a great prize package! Thanks for the opportunity!